As those of you who know me will know, I do quite a lot of crafts, and I go through phases of being addicted to different things. Previously I’ve done cross stitch, knitting and hardanger embroidery, and my most recent passion is for crochet. I started to learn last August, after spending 2 days sat behind a stall at a craft fair with my friend Inga. I started with snowflakes, and made Christmas tree decorations. 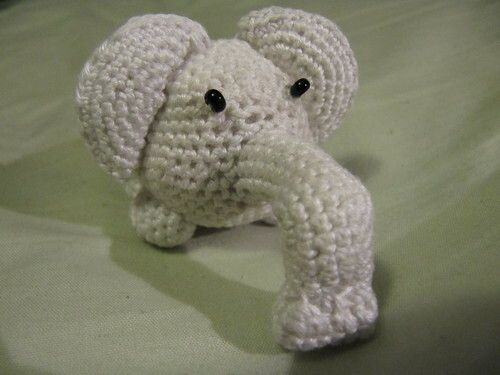 And now, I’ve moved onto amigurumi. Amigurumi, as the name suggests, is a Japanese craze for making small cute dolls, usually crocheted but sometimes knitted. The term is derived from two Japanese words, “ami” meaning crocheted or knitted, and “nuigurumi”, meaning stuffed doll. Not being one for taking these things slowly, I started with possibly not the easiest of choices – an elephant. The pattern is a free download from Lion Brand yarn. The pattern is freely available, but you do need to register with the Lion Brand site. It’s well worth doing, as they have lots of free patterns available. I made him in white as that’s what I had from making the snow flakes. And I had some trouble with his trunk, but all in all as a first attempt I am pretty happy with him. Various things recently have started me thinking about aging. In the last few months, my Grandmother has died of breast cancer, and I have had to have my cat Pepper put to sleep, again probably due to cancer. They were both what you would describe as old – 78 and approx 14 respectively, which doesn’t make it easier, but does at least mean it makes some sort of sense. Around the same time, a friend from University was killed when he was hit by a bus. 22 is not nearly old enough. At the other end of the scale, I feel like I have had to seriously grow up in the last couple of years. I don’t feel old enough or experienced enough for many of the roads I have started down, or for any of the things that friends of my age are doing (moving to the US, getting married, presenting scientific papers across the world…). At what age do you stop wanting to be older (like when I was a kid, and the half year on 6 and a half was so important), and start wanting to be younger? I think I’m stuck somewhere in the middle at the moment. I would like to be younger, because then I wouldn’t have to deal with everything which is happening in my adult life, but I would also like to be older, to better deal with the aforementioned happenings. I’m not sure I really had a direction I was going with this post, or really a point of any kind I was trying to make. I guess I’m just trying to create some kind of order in my thoughts; make some sort of sense of the chaos that is life, which seems to have become just that bit more chaotic in recent times. Thankfully the stress seems to have all melted away now that we’ve exchanged, and I’m just excited about moving in (25th September). So now I am starting on the fun of planning the curtains, the carpets, which colour paint, furniture etc… I just hope I don’t drive anybody mad in the mean time! On Wednesday 10th June I attended the first Cambridge Geek Night. No, I know I’m not a geek, but David was one of the organisers, so I went along to support him. I was also hoping to meet some new people and maybe manage to partially immerse myself in this “geek world” he is a part of. I was not disappointed. A stronger than expected turnout for the first event was a pleasant surprise, with a variety of people attending. I was also surprised by how welcoming people were in general of a non-geek in their midst; I have found geeks en-masse to be a very daunting prospect on occassion. There were of course some people who were very confused as to why I was there, but I felt no hostility from them, as I have sometimes experienced in the past. I would also like to extend praise to the main speaker who I think was excellent. Gareth’s talk on Message Queues was interesting and generated a lot of questions from those present. But most of all I was extremely impressed with his ability to pitch his talk at a variety of levels. I had practially no knowledge of the subject prior to the evening, and fully understood almost everything he had to say. However, the rest of the room also seemed to gain a lot from the talk, despite already having far more knowledge on the subject than I did. I am certainly looking forward to the next event, currently planned for early August. If anyone has any comments as to how I could improve the shop, or how to improve the earrings that I make, they would be very gratefully received. As it says, just a quick update for those of you who actually know me, and use this as a way to keep a vague eye on my comings and goings. Buproprion is still wonderful, although side effects are a bit of a pain (the timing of the second dose most days either leaves me unable to sleep, or with a headache) but at controlling my mood it’s doing remarkably well, considering the circumstances. David and I split up in May, and we’re in the process of vacating the house, and I’m moving in with my parents. I will still be working in Cambridge. My Gran has broken her arm, and about a week later been taken into hospital because she was bringing up blood. No news on what’s wrong as yet, and it doesn’t affect me directly, but the strain on my parents obviously gets partially passed on. It’s coming up to my year end at work (31st July) so my days are hectic, stressful, and nowhere near long enough! We’re also trying to prepare for a colleague to go on maternity leave, and my fixed term contract ends on 1st August, and has not yet been renewed. All in all I’m stressed, tired and obviously struggling, but the buproprion seems to be stopping me from descending into a complete gibbering, crying wreck. I am having some trouble with anxiety, and I worry that the drugs are making me numb to some of the pain, meaning that I might have to deal with it at a later date. But for now I’m functioning, more or less, and I’m thankful for anything I can get. On a more positive note, I have decided to study for the CIMA Certificate in Business Accounting. It’s 5 papers, each of which is a multiple choice exam, and I’m teaching myself. I’m part way through what I think will be the hardest (Fundamentals of Ethics, Corporate Governance and Business Law), and the plan is to have them completed by about March next year. My train journies are providing perfect half hour sessions, and I am hopeful that I have the motivation to see this through. I can’t think of anything else momentous happening to me at the moment, so I will leave it there, except to say that I hope your lives are a little happier and a little less stressful than mine at the moment. TTFN. Buproprion Hydrocloride is very commonly used in the US, under the name Wellbutrin. In the UK however, Buproprion is only licensed as an aid to smoking cessation (under the name Zyban). This means that it is rarely prescribed, as doctors have to prescribe off label, and this generally makes them nervous! Thankfully, seeing a consultant has some benefits as he has the experience to be happy to write those prescriptions, since we’re running out of alternatives. I have been taking buproprion for about 6 weeks now. 4 weeks on 150mg once a day in the morning, and then increasing the dose to 150mg twice a day, one in the morning, one at lunch. The initial side effects from Zyban were unpleasant to say the least. I felt terrible for the first few days, but thankfully it improved quite quickly. The main effects were nausea and decreased appetite, as well as very disturbed sleep. I originally took it at lunch time but got very little sleep, in part from not being able to drop off, and in part from nightmares disturbing me when I was asleep. Moving the dose to first thing helped a lot, and it quickly improved. The nausea improved after about 3 days, but my appetite has been slightly suppressed ever since (although it is helping me to lose weight!). After 4 weeks we thought it might be helping, so the dose was doubled. It has to be taken in a split dose, so morning and lunch seemed the most obvious option. I think it is working for my mood really quite well. And the original side effects of nausea and disturbed sleep have reduced to a level such that they are not noticable day to day. Other side effects which started with the dose increase are more of a problem though. I’m sweating much more, I have daily headaches (which although fairly mild are not pleasant) and there’s a constant ringing in my ears, although I can only hear it when I’m somewhere quiet, for example trying to sleep. Overall, I like Buproprion. The improvement in my mood is well worth a few annoying side effects and feeling tired. I’ll see how things go for the next few weeks, but I am hopeful this will work and I’ll be able to put off the dreaded MAOIs for a bit longer.